My consumer choice this year was “Small Business Saturday” – specifically, quirky mom-and-pop subculture gallery shop Evermore Nevermore on Main Street in downtown Mesa. Bob and Debbie Leeper have operated this Second Friday art walk pit stop for more than two years. 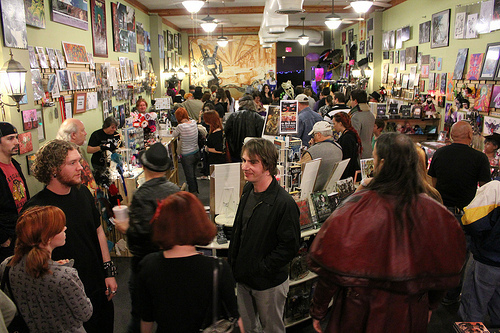 It’s a fun and quirky destination for comics and books, zombie stuff, ray guns, gothic and steampunk accessories, and off-the-wall local art and jewelry. So I was really sad when I read their Black Friday blog announcing they’ll be closing Friday, December 9. They also announced a going-out-of-business sale: 25 percent off everything, including all the local art. Attention artists and musicians in downtown Phoenix: are you tired of renting U-Hauls to transport your music equipment and art to and from gigs and galleries? There’s a new, non-profit service called Vanasa you might consider using. Dubbed “an alternative to U-Haul for artists and musicians in downtown Phoenix,” Vanasa is a 1994 Chevy Box Van owned by Phoenix promoter/arts supporter Jason Ayers. He writes on the Vanasa Facebook page that he chose the name Vanasa because it incorporated his love for NASA and space exploration. Vanasa has an automatic transmission and a video camera for backing up. Ayers uses the van for his own projects and to go to the annual Burning Man festival, but he says aside from that, ol’ Vanasa doesn’t see much action. So he’s offering to let local artists and musicians use the van for free in downtown Phoenix. All he asks in return is for borrowers to put some gas in the tank before they bring the van back. For more information, check out the Vanasa Facebook page.